To some readers, I am sure, I must sound like a one-note Johnny. I have a fixation on our national debt because it is so massive and so many apparently well-informed people are so complacent about it. Sometimes I feel like I’m beating my brains out by discussing this issue so often. But I don’t know what else to do. As recently as 2007 our public debt (on which we pay interest) was $5 trillion and, with an average interest rate of 4.8%, net interest expense was $237 billion. In 2016 we owed $14.1 trillion and paid an average interest rate of 1.8% for an interest payment of $240 billion. In other words, although our public debt has almost tripled in ten years, the interest rate is just over 1/3 of what it was in 2007. So our interest payment hasn’t changed. Interest rates are now starting to head back up. If they return to the 2007 level of 4.8%, then today’s public debt ($14.9 trillion in 2017) would require an interest payment of $715 billion. At the rate of 6.7%, prevailing in the 1990s, today’s debt would require an interest payment of $998 billion. That represents almost 1/3 of today’s total federal revenue. Most of our debt is financed with 10 year Treasury Notes. 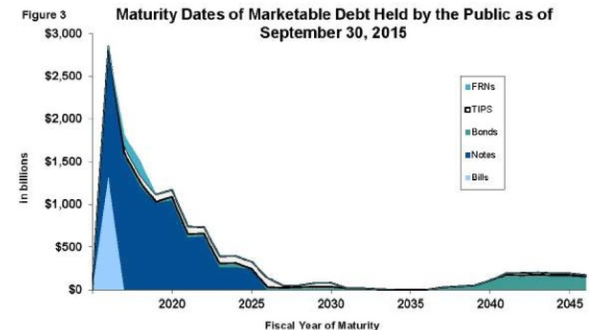 “Of the marketable securities currently held by the public as of 9/30/15, $7.4 trillion or 58% will mature within the next four years.” (see GAO chart) In other words, the huge increase in debt over the past 10 years will soon have to be paid for by Treasury. This will almost surely cause more inflation which will lead to a further increase in interest rates. Conclusion. Unwinding our current debt will require painful cutbacks over a period of years. But right now we are making the problem even worse with continued deficit spending. How will our increasingly perilous situation ever be reversed? This entry was posted in debt, deficit, Jack Heidel, James Grant, Jon Hall, public debt and tagged debt, deficit, fiscal responsibility, jack heidel, James Grant, Jon Hall, public debt by jackheidel. Bookmark the permalink. I view the repug vote as a toss-up: the coalition style vote spread reflected a lack of recognition by many that the law basically presented a means to set up the Senate for rational reform legislation and a stab at true deficit recognition, both paralyzed by a last-minute, extreme investment of political capital by a coalition probably of the Governors, insurance industry, medical schools and Complex Healthcare institutions. Each portion of the coalition probably had their own unique fears. Well, I’ll add my own. It looks increasingly like the ultimate outcome will be Medicare for all…then we’ll reeaaallllyyyyy have big financial trouble or a run on the bank by marginally financed hospital systems. Just as a reminder, the first physician union-strike occurred in March of 1975 by the Committee of Interns and Residents (CIR) of the New York City Hospitals. Their Union was organized in 1958. I was a member for one year 1969-70 (Harlem Hospital). I can tell you that collective bargaining is a terrible platform for the meaningful reform of hospital governance. I can’t tell what killed the final bill except that the House Freedom Caucus had something to do with it. But I agree with you. If Congress is unable to act then we will soon be left with no alternative but to enact a single-payer, Medicare for all, system. This is not what I want but apparently some Republicans are too stupid not to see it coming. I find myself in agreement with both of you that the nation’s debt needs to be addressed. But my questions are who should suffer in terms of what services should be sacrificed for the general welfare of society? And who should be most responsible for repaying this debt? Should it be those who so repeatedly go bankrupt? Should it be those who have made the most profits over the years? Should it be those minorities who have been confined both in living quarters and in opportunities for employment? I could go on and on. But I will ask only my most important question, which is,what is the responsibility of the public-at-large to assure that the basics of food, clothing and shelter and general medical services, however that is defined, and quality education, however that is decided? In brief, those who have gained the most, whether it be 1 or 1/10th of a percent, how will they contribute to a more egalitarian society? I agree that the budget should be be balanced “fairly” without specifying what fair means. This means that all programs should be looked at for possible savings. But this won’t happen unless Congress accepts the fact that it must be done now and that doing this cannot be delayed until some future time. It will be impossible to do this by just raising taxes on the wealthy. Entitlements will have to be adjusted as part of a general plan. Everyone will have to sacrifice. In fact, if everyone does sacrifice a little bit, it won’t be a burden for any one class of people. I think there is a big difference between our world views. I have always liked the premise from Lord Acton. I think it was him. Anyway, it was “Power corrupts; absolute power corrupts absolutely.” I assume that our Founding Fathers understood that better than most Americans of the present. I don’t see those with power that won’t corrupt to protect their own. To combat that the Founding Fathers hoped the 3 branches of government would check one another. But that is going to be difficult in current times with the Conservatives controlling all three branches of government. We shall have to rely upon the press and other means of communication to challenge the government. They must be the 4th branch of government. My reason for being a “religious atheist” comes from my belief that humans constitute both good and evil. All major world religions support that position, thus the religious element of my belief system. It falls in line with my basic sense of life that we must begin at the core of being. Control of the Presidency, House and Senate is constantly changing between the two parties depending upon election outcomes. Now all three are controlled by the Republicans but it was just the opposite in 2009 – 2010. When one party messes up the other party wins more elections. That is the strength of our system.